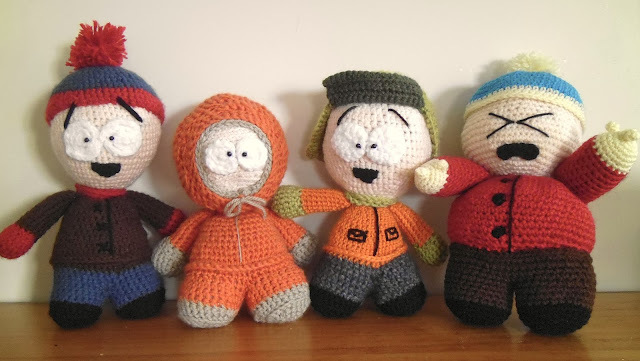 Last Christmas, I wanted to make a set of South Park characters as a gift for my partner, as it is his favourite show. I scoured the internet for a pattern, and couldn't find anything that really looked like them. The ONLY pattern I could find that didn't make the characters look all weird and out of proportion was an amigurumi pattern. Amigurumi is basically Japanese for crochet dolls or toys. So, I taught myself to crochet and made them! Since I was learning as I went, and Kenny was the first thing I had ever crocheted, the poor things suffered in quality a bit.... But they look pretty happy to me! I'm so glad to finally have them finished! !